2nd floor, City Hall, 121 N. LaSalle St., Chicago. Protest to follow press conference. Opponents are demanding that public subsidies for both Lincoln Yards and ’78’ projects be scrapped and TIF funds invested in public schools, affordable housing in distressed neighborhoods. 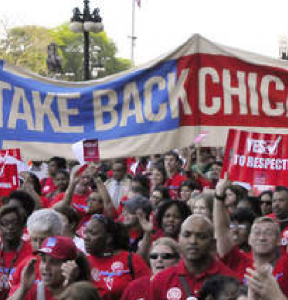 CHICAGO—As part of sweeping public opposition to $2.4 billion in public subsidies for two new luxury neighborhoods, CTU members and allies will hold a press conference and protest beginning at 4:30 p.m. on Tuesday, April 9 at City Hall, 121 N. LaSalle St. The press conference and protest are part of a series of actions that aim to scrap multi-billion dollar public handouts to the luxury development projects. 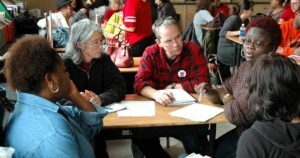 Educators and grassroots organizers want TIF funds to be spent instead in economically distressed neighborhoods as TIFs were originally designed, to alleviate Chicago’s critical shortage of affordable housing and adequately fund the city’s public school communities. 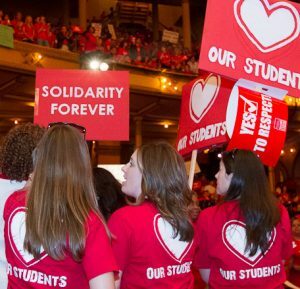 The massive outlay of public funds would more than fully fund the CTU’s contract demands to ensure that each school community has smaller class sizes, wrap-around supports, special education services, adequate numbers of bilingual education teachers, a school library—with a librarian—and other critical frontline staff. Lincoln Yards’ TIF will cost Chicagoans $900 million in direct infrastructure costs and $400 million in financing, while the “78” will cost taxpayers $700 million in direct costs and $400 million in financing. The costs to taxpayers for both projects could also rise, while public schools expect to lose upwards of a billion dollars in funding from the handouts that would otherwise have gone to CPS. Opponents have called the public subsidies to the luxury developers another ‘parking meter deal‘, in a parallel to former Mayor Richard Daley’s despised and massively costly sell-off of public revenue from the city’s parking meters to politically connected investors. Lone Star, one of two Lincoln Yards financial partners whose wholly owned subsidiary stands to receive half of the first proposed Lincoln Yards TIF payout of $490 million, is built on a business model of private equity pillage that includes payday loans, bulk home loan buying and ruthless mortgage foreclosure tactics. CEO John Grayken’s multi-billion dollar company has been sued in New York for profiting from the foreclosure pushout of that city’s Black families. Activists say his profiteering from Lincoln Yards underscores the projects’ distorted agendas.